Suffering from depression is a very lonely journey. Friends don't understand. Family members are confused. They see you on a good day, then wonder what happened when they see you on a bad day. Sometimes they accuse you of not trying. Maybe you should just "snap out of it" and stop feeling sorry for yourself. For those that suffer, like myself, it is a solitary quest toward wellness. Right now on PBS: Depression Out of the Shadows is a must to understand the darkness that envelops those with depression. Depression is not a simple disease to explain, treat or cope with. It can be even more frustrating for family and friends who don't fully comprehend the challenges the patient endures. This twelve chapter program is broken up into small digestible segments. You can watch it start to finish or bookmark the link and go through each chapter at your leisure. 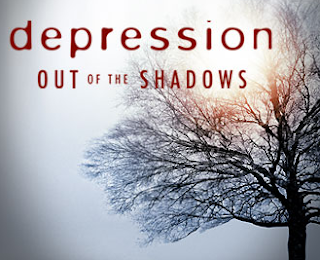 If you suffer from depression or know someone who does, you need to watch this powerful look into all facets of depression. Understanding is the only way we can truly help those who suffer. Misconceptions, prejudices and false information are highly detrimental to those with depression. No one chooses depression. It is a condition that requires attention or it can ruin one's life. Support is critical. If you love someone with depression, watch this show. If you have depression, watching this show and it will give you ammunition to discuss your condition with your family and friends. Click on the fourth item on the right, Watch The Program.